The Northwest Missouri State Bearcats have won their fifth Division 2 National Championship after crushing the Shepherd Rams 34-7. The defense recorded 10 sacks against Jeff Ziemba and stifled the Rams offensively. The game could not have started any worse for Shepherd and any better for Northwest Missouri State. The first play from scrimmage for Shepherd resulted in a high snap over Ziemba’s head and was recovered by Northwest Missouri State’s Cass Weitl. Two plays later, Jordan Grove had an easy 1 yard touchdown run to make it 7-0 just 47 seconds into the game. The Rams had a nice start to their next drive with Ziemba connecting on a 37 yard pass to Billy Brown, but the drive stalled after that big play. The Bearcats would lose a fumble on the next drive, but Shepherd could not take advantage going three and out. The next drive for Shepherd had promise with the Rams driving to the Northwest Missouri State 35 yard line. However, one of the Bearcats’ 10 sacks, this one by Collin Bevins, forced a punt. The Rams had great field position again on the following drive after forcing the Bearcats to punt from their own four yard line. Once again, Bevins sacked Ziemba for a loss and led to a punt. The Bearcats offense would finally get the big play with Brady Bolles finding Jordan Grove wide open beyond the safety for a 76 yard pass play. Bolles would finish the drive with a play action pass to Shane Williams from a yard out for a 14-0 lead. The Bearcats got the ball back with over 4 minutes remaining in the first half and were able to drive for a field goal to make it 17-0. The Bearcats would have been content with that lead, but a big return on the ensuing kickoff by Ben Trewyn gave Shepherd a good opportunity for points. That ended quickly as Ziemba’s pass was picked off by Bryce Enyard and returned 59 yards for a touchdown. The Bearcats led 24-0 at half and they did not let off the gas in the second half. Northwest Missouri State marched down the field to start the second half, but missed a 39 yard field goal. That gave some momentum to Shepherd, which turned that miss into a touchdown with Ziemba and Brown connecting on a 21 yard score. That made it 24-7, but the Bearcats put together a 5 minute drive that resulted in a 22 yard field goal by Simon Mathiesen to make it 27-7. The defense came up with another third down sack to prevent any chance of the Shepherd offense scoring on back-to-back possessions. The Northwest Missouri State offense salted the game away and went up 34-7 thanks to another 1 yard touchdown by Jordan Grove. Grove had 3 rushes on the game for only 2 yards, but two of those carries went for touchdowns. He also had a 45 yard pass completion to Dre Washington to set up the field position that led to the 22 yard field goal. Then there was his receiving stats, which were 5 catches for 104 yards. The duo of Phil Jackson (21 carries for 109 yards) and Cameron Wilcox (12 carries for 58 yards) led the rushing attack for the Bearcats. Brady Bolles went 20 of 27 for 233 yards and a touchdown while Shawn Bane was the second leading receiver with 6 grabs for 64 yards. Northwest Missouri State had 462 yards of offense and went 7 of 14 on third down. Shepherd could not get much going on offense as noted by their 97 total yards of offense. They had 136 yards passing from Jeff Ziemba, who was playing through an injured AC joint, but finished with negative 39 yards rushing thanks to all the sacks. Allen Cross was the top rusher for the Rams with 11 carries for 27 yards while Billy Brown was easily the top receiver with 6 catches for 95 yards and the lone Shepherd touchdown. The Rams went 3 of 12 on third down and finished with only 7 first downs for the entire game. The Bearcats had 10 total sacks in the game with Collin Bevins leading the way with 4 of his own. Brock Sherman and Jacob Vollstedt each had two while Brandon Yost and Nicholas Turner had one apiece. This was the first appearance in the Division 2 National Championship game for Shepherd while Northwest Missouri State was making their ninth appearance. 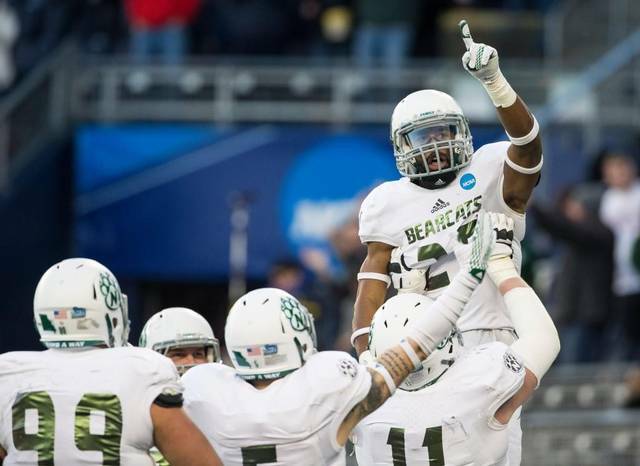 The Bearcats have won 3 of the last 7 Division 2 National Titles after also winning in 2009 and 2013. They are currently the winningest team in Division 2 in terms of National Championships while North Dakota State also has five but play at the FCS level. Head coach Adam Dorrel was in charge of the 2013 squad and has now won two National Titles. Mount Union trailed 14-0 with 11 minutes to play in the second quarter, but ripped off 49 points in the final 37 and a half minutes to win 49-35. Logan Nemeth ran for 220 yards and 2 scores as the Mount Union offense put up over 500 yards despite a blustery and chilly night in Salem, Virginia. Mount Union captured their 12th Division 3 National Championship and first since 2012. St. Thomas struck first with a 24 yard touchdown pass from John Gould to Charlie Dowdle. It was originally called incomplete, but a review overturned that call and made it a touchdown as Dowdle pinned the ball against his helmet and had a foot in bounds. Mount Union could not get much going on offense as they failed to move the ball past their own 45 yard line in the first quarter. The Tommies made it 14-0 with 11 minutes to play in the second quarter by going for it on fourth and goal from the one. Jordan Roberts was able to power his way in for the score and put the Purple Raiders on the ropes early, but they responded with a scoring drive. Some good passing from Taurice Scott and nice catches by his receivers led to a touchdown pass. Scott hit a wide open Lane Clark for a 7 yard touchdown pass. After forcing a three and out, the Mount Union offense needed only three plays to tie the game at 14. Scott hit Roman Namdar in the back of the end zone from 29 yards out to make it 14 apiece, a score that would hold through halftime. The scoring came fast to start the second half with St. Thomas scoring on a fourth and 2 pass from Gould to Nick Waldvogel who was able to get behind the safety for the 58 yard touchdown. Mount Union need only four plays to respond with Scott connecting with Clark again from 14 yards. This time, Clark bobbled the ball twice before hauling it in for the touchdown. The first play from scrimmage for St. Thomas resulted in a lost fumble by Waldvogel that was recovered by Mount Union at the Tommies’ 39 yard line. A pass by Scott to Braeden Friss for 13 yards was followed by three straight runs from Bradley Mitchell including the 6 yard score to make it a 28-21 game. After another three and out, Mount Union was in business after a 42 yard run by Nemeth. The drive was capped off by a nice 18 yard touchdown run from Scott to make it a two score game in favor of the Purple Raiders. St. Thomas needed a scoring response and they got it in a strange fashion. After a holding penalty, they were faced with a first and 20 and gave the ball to Waldvogel on a rushing play. Waldvogel fumbled again, but the ball bounced right in front of quarterback John Gould who picked it up and sprinted 56 yards to the end zone and a 35-28 deficit. The Tommies had a chance at the end of the quarter for possibly more points, but opted to fake the 49 field goal attempt despite having the wind at their back and needing 12 yards. Mount Union was all over it as Dowdle gained only three yards. Mount Union took advantage of the missed field goal by driving 71 yards for a touchdown capped off by Logan Nemeth’s first score of the game. The defense forced a three and out and Nemeth scored his second rushing touchdown with a 36 yard run and eight and a half minutes remaining. St. Thomas did score on their next drive with Roberts running in from four yards out. They also went for an onside kick and recovered it, but Gould threw a pick on the first offensive play of the series. Mount Union would run the clock out with a typical Purple Raiders drive of running and a nice 26 yard catch by Nemeth on third and nine. Nemeth had 30 carries on the night for 220 yards and 2 touchdowns while Bradley Mitchell was explosive with 9 rushes for 63 yards and a score. Taurice Scott had 13 carries for 54 yards and a touchdown, but also went 12 of 19 for 201 yards and 3 touchdowns through the air. Roman Namdar was the top receiver for Mount Union with 5 catches for 127 yards and a touchdown. Lane Clark had an efficient night with 2 catches for 20 yards and 2 touchdowns. Mount Union finished with 531 yards of offense, had 23 first downs, and went 5 of 13 on third down. They did not have a turnover in this game. St. Thomas had momentum early in the game and also early in the second half, but could not overcome the Mount Union offense that was sluggish in the first 19 minutes of the game. Jordan Roberts finished with 30 carries for 135 yards and 2 touchdowns. John Gould went 8 of 22 for 123 yards and 2 touchdowns, but also threw the pick to end any chance of a comeback. Nick Waldvogel had 4 catches for 78 yards and a touchdown, however, he had 2 fumbles. One of those was on the fortunate bounce while the other led to a Mount Union touchdown. St. Thomas finished with 328 yards of offense, had 17 first downs, and went only 3 of 15 on third down. As expected, the Tommies went for it on fourth down four times and converted three of those. 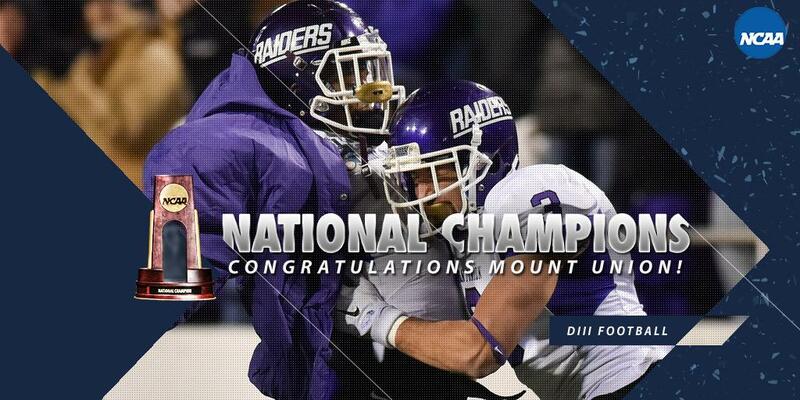 Mount Union finished 15-0 and has now played in 19 Division 3 National Championship Games winning 12 of those. They won their last one in 2012 against St. Thomas 28-10. They have won 8 national titles since 2000. It was the first National Championship win for Mount Union head coach Vince Kehres after losing the previous two seasons to Wisconsin-Whitewater. Just two teams remain standing in the 2015 NCAA Division 2 football season. Shepherd and Northwest Missouri State both enter this game undefeated and one of them will come up just short of their goal for the 2015 season. This game will be played at Sporting Park in Kansas City, Kansas at 4 PM Eastern Time and can be seen on ESPN2 Saturday, December 19. An updated bracket can be found here. We have made predictions for every round of the 2015 NCAA Division 2 Playoffs and have been slightly above .500. The record in round one was 6-6, the second round produced a 6-2 record, the Quarterfinals provided a 2-2 record, and we went 1-1 in the Semifinals. The overall record is 15-11 heading into the Division 2 National Championship. Below is the 2015 NCAA Division 2 National Championship Preview as well as a prediction for the game. As noted above, each team had a bye before playing three straight home games. Shepherd had the tougher time in the three games with all games relatively close. They had to survive against Grand Valley State after leading 34-19 with 6 minutes left to play. A tip by the defensive lineman on the two point pass allowed the Rams to hang on for the win. Shepherd enters this game 13-0 on the season while averaging nearly 40 points and 417 yards per game on offense. The Rams have scored at least 40 points on 9 different occasions in 2015, but they have not scored more than 35 points in their three playoff contests. The offense converts on 48% of their third down attempts (86 of 179) and have converted on 52 of their 59 red zone trips (88%). The quarterback situation is a bit uncertain for Shepherd. Jeff Ziemba is the usual starter, but he was hurt on the Rams’ first possession in the Semifinals and did not return. In his absence, Connor Jessop came in and went 15 of 20 for 173 yards with 2 touchdowns and no picks. The running game will be led by the duo of Allen Cross and Jabre Lolley. Cross has ran for 989 yards with 10 touchdowns while Lolley has 670 yards and 14 touchdowns on the ground. Those two may be leaned on again if Ziemba cannot start. The top receiving threat for the Rams is Billy Brown who has 83 catches for 1,397 yards and 9 touchdowns in 2015. The second leading receiver, Tony Squirewell, has a steep drop off in production with 49 catches for 659 yards and 6 touchdowns. Dalton Boyd has only 4 catches for 52 yards in the Playoffs, but has shown the ability to pop up with a solid game during the season. The defense gives up an average of 17.7 points per game as they have allowed 17 points or less in 8 different games. They have intercepted 16 passes and recovered 10 fumbles, which is 2 turnovers forced per game. The defense allows just under 300 yards per game at 298.4 yards and does a great job on third down allowing only a 29% conversion rate. The red zone defense has been decent allowing only 30 trips, but giving up 19 touchdowns on those trips. The leading tackler for Shepherd has been Keon Robinson with 79 total tackles, but a trio of other players could wreak havoc. Shanell Jenkins leads the team with 22 tackles for loss including 12.5 sacks. Myles Humphrey (5 sacks) and Isaiah Ross (6.5 sacks) both have 12 tackles for loss apiece. Adam Coles is the top defensive back with 5 interceptions and is third on the team in pass breakups with 10. Shepherd gave up a season high in passing yardage last week with 334 yards and 3 touchdowns to Grand Valley State. Their third highest total was also in the Playoffs in the Quarterfinal game against Slippery Rock with 253 yards and one touchdown through the air. The special teams will be led by kicker Ryan Earls who is 18 of 23 on the season with a long of 41 yards. He has had only 1 kick blocked and also performs the kick off duties. Northwest Missouri State had easy wins in the first two games, but nearly blew a 24-6 halftime lead against West Georgia. They lead 24-23 with 4:30 left in the game before a quick strike on offense and a pick six on defense sealed their trip to Kansas City. Northwest Missouri State is 14-0 heading into the National Championship with the offense putting up 42 points and 438 yards per game. The offense scored put up at least 38 points 9 times in 2015 including all three games in the playoffs. The offense converts 46% of their third downs (106 of 229) and has 75 trips inside the red zone. They have converted 69 of those 75 trips (92%) with 48 of those going for touchdowns. The offense is headed by Brady Bolles at quarterback. He has thrown for 3,748 yards with 29 touchdowns, but also has been picked off 9 times. In the three playoff contests, Bolles has thrown for 840 yards with 7 touchdowns against one interception. Bolles can take off when need, as shown by his 100 rushing attempts for 235 yards and 7 touchdowns, but his first choice is to pass. Phil Jackson leads the team in rushing on the season with 842 yards and 14 touchdowns on 170 carries, but has not been as effective in the Playoffs with 41 carries for 153 yards and 3 touchdowns in the 3 games. Cameron Wilcox is the second leading rusher with 398 yards and 3 touchdowns. In the Playoffs, he has 29 carries for 143 yards and 2 touchdowns despite seeing less action than Jackson. The top Bearcat receiver is Shawn Bane with 1,143 yards and 8 touchdowns on 76 receptions. The second third, and fourth leading receivers all have similar stats around 500 yards. George Sehl has 29 catches for 517 yards and 7 touchdowns, Shane Williams has 34 catches for 513 yards, and Jordan Grove has 42 grabs for 493 yards and 7 touchdowns. Even Clayton Wilson (32 catches for 275 yards and 3 touchdowns) and Dre Washington (27 catches for 250 yards) can come off the sideline and be part of the passing game. Northwest Missouri State’s strength is on defense as they have allowed less than 13 points per game including 8 games where they have surrendered 13 points or less. The rush defense is where the Bearcats are strongest giving up only 66 yards per game while the total defense allowed per game is at 233. The Bearcats allow opposing offenses to convert only 24% of their third downs and only 23 red zone trips the entire season. However, of those 23 trips, they have allowed scores on 21 of those 23 trips. The Bearcats defense also likes to force turnovers. They have recorded 25 interceptions with three of those returned for touchdowns. Kevin Berg has 8 of those picks while he recorded six interceptions in a three game stretch in October. 15 fumbles have also been recovered by the Bearcats. Jacob Vollstedt has been a tackling machine for the defense with 110 total tackles including 15 for loss and 11 sacks. Collin Bevins leads the team with 22.5 tackles for loss with 11.5 sacks, Brandon Yost has 16.5 tackles for loss and 7.5 sacks, and Brock Sherman has 13 tackles for loss with one sack. Cass Weitl has managed to record 11 tackles for loss and 5.5 sacks as well. The Northwest Missouri State defense has allowed some passing yardage in the Playoffs in their last two games. Against Emporia State in the Quarterfinals, they gave up 324 yards and a touchdown as well as 93 yards and a score on the ground. Against West Georgia last week, they allowed 289 yards and 2 touchdowns and 104 yards on the ground. The majority of West Georgia’s yardage came in the second half after trailing by three scores. Simon Mathiesen has connected on 23 of 28 field goals for Northwest Missouri State with a long of 46 yards and no field goals blocked. There are stark differences between these two programs in the National Championship. Shepherd has never made the Championship Game prior to this year with their best finish being in the Semifinals back in 2010. However, Shepherd has only been in Division 2 Football since 1994. Northwest Missouri State has won 4 National Championships in 1998, 1999, 2009, and 2013. They have also played in four other National Championships (2005, 2006, 2007, and 2008) but lost each of those four contests by a touchdown or less. What makes this game interesting is that Shepherd may or may not have their starting quarterback. If Shepherd tries to rely on their run game to open up the passing lanes, then Northwest Missouri State could have strong success. However, Shepherd may be able to pass the ball even without Ziemba. The offense for Northwest Missouri State should be able to have success as well led by their passing game and Brady Bolles. The run game, while not the best, could come in handy on short yardage plays. We will take Northwest Missouri State to win the 2015 NCAA Division 2 National Championship by a score of 34-21. The final four teams remaining in the 2015 FCS Playoffs will be contesting the Semifinals on Friday, December 18 and Saturday, December 19. We went an even 4-4 in the first round, 5-3 in the second round, and 3-1 in the Quarterfinals for a 12-8 record through three rounds. An updated bracket can be found here via the NCAA’s website. The Richmond at North Dakota State game will be played on Friday evening at 8 PM Eastern Time on ESPN2. Sam Houston State at Jacksonville State will be at 12 PM Eastern Time on Saturday and can be seen on ESPNU. The schedule can be found here. Below are the 2015 FCS Playoff Semifinals Predictions. Sam Houston State has played in the first three rounds of the FCS Playoffs. The Bearkats defeated Southern Utah 42-39 at home in a wild game in the opening round and then defeated the #4 seed McNeese State on the road in the second round. Last week, the Bearkats routed Colgate 48-21 at home with big games from Jeremiah Briscoe (358 yards and 3 touchdowns passing) and Cory Avery (197 yards and 1 touchdown on 25 carries). Since the 27-10 loss at McNeese State on November 7, the offense has averaged 45 points and 588 yards of offense per game. Jacksonville State had a bye in the first round before a thrilling 41-35 win in overtime against Chattanooga at home in the second round. The rushing attack was lethal in that game with Eli Jenkins having 195 yards and 3 touchdowns on 24 carries, but he was outdone by teammate Troymaine Pope who had 234 yards and 3 touchdowns on 17 carries. In the Quarterfinal game against Charleston Southern, they put up 506 rushing yards with massive games from those two players again. Jenkins had 250 yards and 3 touchdowns on 16 carries while Jenkins had 195 yards and 2 touchdowns on 21 carries. Even Miles Jones had 67 yards and a touchdown on 13 carries. This game features two of the best offenses the FCS has to offer. Sam Houston State is ranked number one in total yards (7,716), passing yards (4,018), yards per game (551), and touchdowns (75). The Bearkats are also ranked fifth in rushing yards (3,698) and third in points per game (43.3). Jacksonville State is number two in total yards (6,770) and touchdowns (65) while they are ranked third in rushing yards (4,004) and yards per game (521). They rank seventh in points per game at 39.4 per contest. This game should be a high scoring, back and forth affair. Jacksonville State will being using their ground game yet again and they face the 115th ranked rush defense in the FCS by total rushing yards allowed (2,618). Sam Houston State will try the passing game and they faced the 58th ranked pass defense in total passing yards allowed (2,354). Jacksonville State gets the nod at home in what should be an entertaining game at home. We will go with the Gamecocks to win 63-56 and make their first FCS Championship game appearance. Richmond had a bye in the first round before facing William & Mary for the second straight game. They took care of the Tribe again with a more emphatic thumping by a score of 48-13. In the Quarterfinals, they had to travel to face Illinois State where they produced an upset 39-27. The Spiders took a 10-0 lead after the first quarter and never relinquished that lead, but the Redbirds fought valiantly. Kyle Lauletta threw for 369 yards with a touchdown and an interception on 18 of 30 passing. Jacobi Green had 137 yards and 3 touchdowns on 20 carries. The Spiders held the duo of Tre Roberson and Marshaun Coprich to a combined 66 yards and one touchdown on 24 carries. North Dakota State had a bye as well in the first round. They faced Montana at home in the second round where they crushed the Grizzlies 37-6 behind a rush defense that allowed only 6 yards on 19 carries. The defense also had two interception returns for touchdowns while the special teams returned a kickoff for a touchdown to crush any hope of a Montana comeback midway through the third quarter. The Bison faced Northern Iowa in the Quarterfinal game for the second time this year. The Bison gave up a touchdown on Northern Iowa’s first drive, but did not allow the Panthers to reach the end zone after that. They held Aaron Bailey to 101 yards and a touchdown through the air as well as 33 yards rushing on 18 carries. They also kept Tyvis Smith in check with 58 yards on 16 carries. The Bison allowed only 221 yards for the entire game. Despite the rumors of Carson Wentz possibly playing, he did not play as Easton Stick had a solid game going 13 of 17 for 116 yards. King Frazier ran for 107 yards and a touchdown while Bruce Anderson’s 97 yard kickoff return to open the second half gave the Bison the lead they did not relinquish. If it seems like we have seen this before from North Dakota State that is because we have. This will mark their fifth straight year making the Semifinal round with a home game and only one of those games was closer than a touchdown (23-20 win over Georgia Southern in 2012). The Bison are at home and know how to stop potential potent offenses. We like the Bison (yet again) to make their fifth straight National Championship game by a score of 28-17. The FCS National Championship will be played on Saturday, January 9, 2016 in Frisco, Texas. That game will be televised on ESPN2 and the Watch ESPN app at 12 PM Eastern Time. We have reached the pinnacle of the 2015 NCAA Division 3 football season with the Stagg Bowl on Friday, December 18. St. Thomas (MN) and Mount Union will meet to decide the National Champion. The game can be seen on ESPNU at 7 PM Eastern Time. An updated bracket can be found here via the NCAA website. We have made predictions in each round of the Division 3 playoffs with a 14-2 record in the opening round, 6-2 in the second round, 3-1 in the Quarterfinals, and 2-0 in the Semifinals. That brings us to an overall record of 25-5 entering the Stagg Bowl. Below is the 2015 NCAA Division 3 National Championship Preview and Prediction. Both teams played all four prior playoff games at home while this game will be held in Salem, Virginia. Both teams has dominated in those four games as well with St. Thomas posting big wins over St. John’s (MN), Wabash, and Linfield all by three or more scores. St. Thomas has been strong on both sides of the ball. On offense, they have a pretty balanced attack as they average 258 yards on the ground and 271 through the air. That has allowed the offense to put up over 52 points a contest and over 25 first downs per game. The red zone offense is incredible and lethal with 86 trips to the red zone with 69 conversions and 64 touchdowns. The offense is 50% on third down conversions (96 of 191), but they are also not afraid of going for it on fourth down. The Tommies have gone for it 48 times, converting 32 of those (67%). Senior quarterback John Gould has not put up gaudy at only 204 yards passing per game, but he can get the job done through the air. He has thrown for over 230 yards five times this season. He has completed 60.6% of his passes going 177 of 292 for 2,851 yards with 25 touchdowns and 11 interceptions. He will need to be smart with the ball against a high quality defense like Mount Union. The running game goes through Jordan Roberts who has amassed 1,957 yards and 32 touchdowns on the ground. He showed some signs of being nicked against Linfield, but he still managed to rush for a season high 256 yards in the Semifinal victory. When he needs to be spelled, Jack Kaiser will come in. Kaiser has 405 yards and 10 touchdowns this year. Roberts will be the focus for the St. Thomas offense and the Mount Union defense. The go to receiver for the offense is Nick Waldvogel with 64 catches for 798 yards and 3 touchdowns. However, look out for tight end Charlie Dowdle on the big play. He has more yards and touchdowns with nearly half as many catches. Dowdle has 37 grabs for 811 yards and 9 touchdowns. Jack Gilliland has 24 catches for 447 yards and 4 touchdowns while Ryan Bradley has 22 catches for 412 yards and 6 scores. There are plenty of options in the passing game for Gould and that does not even include Roberts out of the backfield. The St. Thomas defense is stout giving up less than 227 yards per game (82 rushing and 145 passing) and only 9.9 points per contest. The Tommies have recovered 23 fumbles and have 12 interceptions. The defense has allowed only 44 conversions on 189 attempts (23%) while allowing only 23 total red zone opportunities in 2015. They have allowed a total of 15 scores on those 23 opportunities. Steve Harrell is the leading tackler for St. Thomas at 84 while Tim McClanahan has recorded 73 stops. The sacks are disbursed evenly with Jesse Addo atop the charts at 8.5, but Harrell is close with 8, Anthony King-Foreman has 7.5, and Ryan Winter has 6.5. Jordan Young has 4 interceptions in the secondary to lead the team while McClanahan has recovered 3 fumbles. The front seven will need to be strong against Mount Union’s running game as well as their dual threat quarterback. Paul Graupner is the kicker and has only attempted 12 field goals on the season. He has connected on 8 of those (67%) with a long of 51. Mount Union did not have any trouble in their first two games with easy wins against St. Lawrence and Albright. Wesley was tougher while Mount Union won comfortably by three scores, but more impressively, they stymied the Warhawks of Wisconsin-Whitewater after giving up the first 6 points and winning 36-6. Like St. Thomas, Mount Union has been dominant on both offense and defense. The offense puts up 53.6 points per contest and racks up 556 yards a game. The rushing attack is excellent at 318 yards a game while the passing game averages 238 a game. Mount Union is 86 of 171 on third down (50%) and has had 96 red zone opportunities. This is where they really dominant their opponents as they have scored touchdowns on 72 of those trips (75%) and 82 scores overall (85%). Taurice Scott is the dual threat quarterback for Mount Union. He has thrown for 3,139 yards (65.7%) with 41 touchdowns against only 5 interceptions. He is also the second leading rusher at 800 yards and 12 touchdowns on 107 carries with just one fumble lost. Scott does not make a lot of mistakes, which means the Tommies will have a tough time forcing turnovers. The rushing attack will lean on Logan Nemeth in addition to Scott. Nemeth has 1,737 yards and 27 touchdowns on 228 carries. Another threat is Bradley Mitchell who has 776 yards and 9 touchdowns on 121 carries. The duo of Nemeth and Scott is bad enough, but Mitchell can pick up chunks too when Nemeth is resting. Tim Kennedy is the top receiver for Mount Union with 80 catches for 978 yards and 5 touchdowns, but Roman Namdar is close in yardage at 976. Namdar has 59 catches and 19 touchdowns to go along with those 976 receiving yards. Another receiving threat is Jordan Hargrove with 46 catches for 704 yards and 7 touchdowns on the season. Mount Union’s defense has been incredible, as usual for this program. They allow only 188 yards per game with 44.5 on the ground and 143.8 through the air per contest. The defense has surrendered only 7.5 points a game including posting six shutouts and 11 games in which they have allowed 7 points or less. As a team they have recorded 64 sacks, recovered 14 fumbles, and intercepted 16 passes. Alex Kocheff leads the team in tackles at 81 from his defensive back position while Tom Lally has 74 tackles from the defensive line. Lally also leads the team in tackles for loss (23.5) and sacks (18), which means he will be a focal point for the St. Thomas offensive line. Mike Furda 15.5 tackles for loss as well as 11.5 sacks. Louis Berry leads the team in interceptions with four despite having limited playing time while Nick Rodriguez has three. Jake Antel does not have to kick a lot of field goals due to the offense’s incredibly efficiency, but he has converted 11 of his 16 attempts with a long of 44 yards. St. Thomas has been here before as recently as 2012 when they lost to Mount Union 28-10. Mount Union has been here a lot in the last 20 years. They have made 10 straight Stagg Bowls and 17 of the previous 19 editions. In the last 19 years, Mount Union has won 10 National Titles, but have not won since that 2012 game against St. Thomas. Both have similar styles in that they like to run the ball, but can have success passing. They also both have strong defenses that do not give up a ton of points either. Despite the stingy offenses, there should be some scoring done by both teams even if it is not done in bunches. Expect a lot of running between St. Thomas’ Jordan Roberts and Mount Union’s Logan Nemeth. We will take Mount Union and their offense to get the job done as well as doing enough to stop the St. Thomas offense (Jordan Roberts as well). Mount Union takes this game 31-24 to win their 11 Stagg Bowl and first National Championship since 2012. The NCAA Division 3 Playoffs are one week from concluding, but there are Semifinals and a National Championship still to be played. The Semifinals are incredibly tantalizing including a matchup we normally see in the Stagg Bowl, but the Committee decided to have the possibility occur sooner rather than later. The schedule can be found here and the updated bracket is here via the NCAA’s website. In round one we went a solid 14-2 and then followed that up with a 6-2 record in our predictions for the second round. In the Quarterfinals, we went 3-1 with our lone loss coming at the hands of Wisconsin-Whitewater (again). The record through the first three weeks of the playoffs stands at 23-5. Linfield’s first game was easy as they crushed Whitworth 48-10 at home in round one. In the second round, they had some trouble with Cortland State, but were never really in danger of losing as they won at home again by a score of 38-22. Their Quarterfinal game against Mary Hardin-Baylor was a great one. Both teams had a fast start with MHB taking a 21-14 lead after the first quarter and they also led 28-14 at halftime. Linfield had a big third quarter to tie the game up at 28 apiece and then took the lead 35-28 midway through the final quarter. That lead did not last long as MHB tied it up at 35 thanks to an 85 yard pass from Zach Anderson to DeNerian Thomas. Linfield was then picked off inside their own 25 to give MHB a chance to reclaim the lead, but Linfield recovered a fumble and ended up kicking the game winning 32 yard field goal as time expired. Oh and Linfield did all of this without their normal quarterback Sam Riddle. Tom Knecht filled in nicely going 38 of 54 for 492 yards with 5 touchdowns and 3 interceptions while Brian Balsiger (7 catches for 150 yards and 2 touchdowns) and Johnny Carroll (10 catches for 140 yards and 2 touchdowns) were his top target. It has been a little less thrilling for St. Thomas, but that does not take away from what they have done. The dominated La Verne at home 57-14 in round one to set up a rivalry matchup in the second round against St. John’s (MN). That game was all about the Tommies as they held a 31-7 lead after three quarters and won 38-19. In the Quarterfinal game last week, they faced Wabash and their high powered rushing attack. They stopped that as well holding Mason Zurek to only 72 yards and a touchdown on 21 carries in a 38-7 victory. Both of these teams have made the Stagg Bowl once before. Linfield did so in 2004 (defeated Mary Hardin-Baylor 28-21) while St. Thomas went in 2012 (lost 28-10 to Mount Union). These two teams also met in the Playoffs back in 2009 (Linfield won 31-20 at home) and 2010 (St. Thomas won 24-17 at home), but it would be unfair to base this game solely on those contests as these are different teams. St. Thomas will try and stop the passing attack for Linfield with their stingy defense and are also focused on getting back to the Stagg Bowl. We will take St. Thomas to win at home in a close on 23-17. Wisconsin-Whitewater has had an unusual path in the Division 3 Playoffs compared to what they normally have. Most year Whitewater would be home for every game through the Quarterfinals, if not the Semifinals. This year, they had to travel for their second round game after destroying St. Norbert 48-0 in round one. Their second round opponent was Wheaton (IL) and the big second quarter in which they outscored the Thunder 24-7 allowed them to take command of the game. They did give up 475 yards of offense to Wheaton, but they stiffened on defense to allow just a field goal in the final 30 minutes. They also traveled for the Quarterfinal game against conference foe Wisconsin-Oshkosh, a team they lost to by a score of 10-7 in the regular season at Oshkosh. Whitewater took a 10-0 lead after the first 15 minutes, but Oshkosh battled back to tie the game at 10 apiece going into halftime. Whitewater took another double digit lead in the third quarter to lead 31-16 before a furious rally by Oshkosh. With 3:42 left, Oshkosh scored to make it 31-29, but the two point conversion failed. Oshkosh still had a chance to win after forcing a punt and getting the ball back at the 50 yard line. However, they were unable to complete three of their passes as they gave the ball back to Whitewater to run the clock out. Mount Union opened with a 55-23 win in the first round against St. Lawrence where they allowed 16 points in the final quarter after building a 55-7 lead. Their game against Albright was similar except they scored more and allowed less. Mount Union won 66-7 to set up another game against offense powerhouse Wesley. Mount Union built a big lead again (not as big as their 70-0 lead in 2014 though) to lead 49-14 at the break before winning 56-35. They did allow 469 yards of offense to Wesley, but they gained 603 of their own including 218 yards rushing and 2 touchdowns from Logan Nemeth while Taurice Scott had 330 yards and 5 touchdowns with a pick through the air. For even the most casual follower of Division 3 football, it is well known that these two teams meet nearly every postseason, but that game is usually the Stagg Bowl and not the game prior. The last 10 years, one of these two teams has won the Stagg Bowl (the last team not named Mount Union or Wisconsin-Whitewater? Linfield). Also, since 2005 these teams have met 9 times in the Stagg Bowl with Whitewater holding a 6-3 edge including 5 of the last 6. This game, however, is not the Stagg Bowl and is being played on Mount Union’s turf. It is possible to put points up against these two teams as noted by the last game for each team. Also consider the fact that Whitewater won 43-34 in 2014 and 52-14 in 2013. Despite that, we are going with Mount Union to win at home in an exciting contest 41-34. And for you Whitewater fans here is a fun fact: the last three times we have picked against Whitewater (2015 Playoffs Quarterfinal, 2015 Playoffs Round 2, and 2014 Stagg Bowl), the Warhawks have won. We have reached the final four teams for the 2015 NCAA Division 2 Playoffs. Both Semifinal games will be played on Saturday, December 12 with the winners facing off for the 2015 NCAA Division 2 National Championship. The schedule can be found here and the updated bracket is here. In round one we went 6-6 with our predictions while we went 6-2 in the second round. In the Quarterfinals, we went back to .500 with a 2-2 record and stand at 14-10 for the Division 2 Playoffs thus far. Both games are predicted below. Grand Valley State has delivered surprise after surprise in the Playoffs. They opened with a big win over Ashland on the road 45-28 in the first round with 230 yards rushing and 4 touchdowns as a team along with 231 yards, 2 touchdowns, and 3 interceptions from Bart Williams. They won their second round game as well on the road, defeating Ferris State 38-34 after a back and forth game that saw Williams throw 4 touchdown passes. The latest game was probably their most impressive as they crushed the defending National Champions, Colorado State Pueblo, 31-7 on the road. GVSU led 21-0 after the first quarter and 31-7 at half while holding CSU Pueblo to just 157 yards of offense. Grand Valley State racked up 527 yards on one of the better defense in Division 2 with Marty Carter rushing for 231 yards and a touchdown. Shepherd started with a bye as the top team in their region and then faced Indiana (PA) in the second round. Shepherd erased a 13-3 deficit to start the fourth quarter with two touchdowns in the final 12:13 including the game winner with 2:03 left in the game. Shepherd’s Quarterfinal game was at home against Slippery Rock where they gave up an early touchdown, but ripped of 25 straight points to take command of the game at 25-7 late in the third quarter. Slippery Rock did score 9 points to make it a 25-16 game entering the fourth quarter, but the defense came up big to stop anymore scoring from happening. Jeff Ziemba threw for 255 yards, 2 touchdowns, and 1 interception in the Quarterfinal win. What Grand Valley State has done thus far makes them not only the biggest surprise, but also the most impressive team. They will have a fourth straight road game, but that has clearly not been an issue for them. Shepherd has not allowed more than 20 points in their last five games and the defense has played well in the two Playoff games. After going against GVSU for the first three rounds, we will take them to win on the road 23-20 and make it to the 2015 Division 2 National Championship Game. West Georgia was the top seed in their region, which means they had a bye in the first round. In the second round, they played against Valdosta State at home and had a tough time against them. Dallas Dickey’s 9 yard run with 3:09 remaining made it 27-20 while the defense put the VSU offense on its heels on the next drive and forced a turnover on downs to win the game. West Georgia ran for 292 yards and 2 touchdowns on 44 carries as a team with Devontae Jackson (120 yards and a touchdown), Dallas Dickey (100 yards and a touchdown), and Lamarcus Franks (71 yards) all having solid days on the ground. In the Quarterfinals, West Georgia gave up an early touchdown to Tuskegee after a fumble, but that was all Tuskegee would score as West Georgia put up 35 unanswered points to end the game at 35-6. Dickey threw for 398 yards and 3 touchdowns while the defense allowed only 146 yards of total offense for the entire game. Northwest Missouri State also had a bye in the first round and then faced Humboldt State at home in the second round. The Bearcats had no trouble as they led 34-0 at half and won 54-7. The defense allowed 72 yards passing and negative 24 yards rushing for a grand total of 48 yards of offense to Humboldt State. Brady Bolles threw for 276 yards and 2 touchdowns on 26 of 33 passing while the team ran for 187 yards and 4 scores on the ground. The Bearcats faced a familiar foe in Emporia State for the Quarterfinals, but they were dispatched as well. NWMSU led 17-0 before Emporia State scored, however, each ESU score was answered by a NWMSU score and the Bearcats cruised to a 38-17 win. Bolles had 329 yards and 3 touchdowns through the air. The Bearcats did allow over 400 yards of offense to Emporia State (Brent Wilson threw for 324 yards and a touchdown while rushing for another score). This game will most likely be a defensive battle, which favors the Bearcats at home. They are one of the best teams (if not the best to some) in the nation and they are heavily favored to win. We are going with them to win 31-7 and make it back the Division 2 National Championship. We are down to the final eight teams in the FCS Playoffs this weekend. After going 4-4 in round one, we improved to 5-3 in the second round to have a playoff total of 9-7 going into the final three rounds. The four games are split evenly with two games played on Friday and two on Saturday. The schedule can be found here and the updated bracket is here via the NCAA website. Charleston Southern had a bye in round one and then had to take on a hot Citadel team at home in the second round. After holding The Citadel to 181 yards in their regular season meeting, they did slightly worse by allowing 199 yards in the Second Round Playoff matchup. The Bucs offense did worse in terms of yardage than The Citadel (267 to 199), but did better when it mattered most. Mike Holloway had touchdown runs of 32 and 41 while finishing with 120 yards on 13 carries. Jacksonville State also had a bye in the first round as the top seed and they had a great game in round two against Chattanooga at home. The Mocs took a 7-0 lead before Jacksonville State rang up 21 straight points. The Gamecocks held a two touchdown lead on two separate occasions, but their lead evaporated thanks to two fourth quarter touchdowns that gave Chattanooga a 35-28 lead. Troymaine Pope ripped off a 75 yard touchdown run to tie it and the game ended in overtime after an interception by the JSU defense and a touchdown run by Eli Jenkins. These two teams did not meet in the regular season. The big matchup in this game will be Charleston Southern’s #22 ranked rush defense (and #2 defense as ranked by yards per game) against the Jacksonville State rushing offense. The Gamecocks have the #4 ranked rush offense and #4 ranked offense by yards per game. Against Chattanooga, Troymaine Pope had 17 carries for 234 yards and 3 touchdowns while Eli Jenkins ran for 195 yards and 3 touchdowns on 24 carries. The matchup of strength on strength will be fun to watch and we are taking the top seeded Jacksonville State Gamecocks to win by a score of 27-20. The winner of this game will play either Sam Houston State or Colgate in the Semifinals. Colgate opened with a big road win against CAA team New Hampshire, 27-20. The balanced offense (189 yards rushing and 188 yards passing) was able to withstand a 41 of 56 for 309 yards (1 touchdown and 1 interception) performance from Sean Goldrich. In round two, the Raiders had a 17-0 lead against James Madison before blowing that and trailing 28-24 at halftime. The game was close for the rest of the way with Jake Melville’s three yard run giving them the 44-38 lead (and win by that score) in the fourth quarter. James Holland had 165 yards and 2 touchdowns rushing while Melville ran for 163 yards and 2 touchdowns in addition to his 120 yards and 2 touchdowns passing. Sam Houston State won their opening round game against Southern Utah at home in a thriller 42-39. The 344 yards rushing led the way, but the Bearkats also had 235 yards through the air including the eventual game winning score on a 55 yard touchdown pass from Jeremiah Briscoe to Yedidiah Louis. Round two was on the road against undefeated McNeese State 34-29. Briscoe threw for 313 yards with 3 touchdowns and an interception while Cory Avery had 147 yards and a score on 30 rushes. Daniel Sams was held to 225 yards passing (4 touchdowns and a pick) and 57 yards rushing on 19 carries. Both of these teams are a bit surprising thanks to their upset wins in the second round (and first round for Colgate). This game has a high scoring feel to it especially with Sam Houston State’s #1 ranked offense in yards per game at 543 per game. The defenses are decent at best and that is why this game could have both teams scoring in the 40s. We are going with Sam Houston State to win 52-45 to get back to the FCS Semifinals. The winner of this game will play either Charleston Southern or Jacksonville State in the Semifinals. Northern Iowa has played two games in the FCS Playoffs. The first was at home where they thrashed Eastern Illinois 53-17 with three touchdown passes from Aaron Bailey (on just 11 attempts) and 147 yards rushing and a touchdown from Tyvis Smith. The second round saw UNI travel to Portland State for a late kickoff, but once again the Panthers did not yield more than 17 points in a 29-17 win. Aaron Bailey had just 31 yards passing on 7 of 14, but he ran wild to the tune of 200 yards and 2 touchdowns. His backfield mate Tyvis Smith also had 207 yards and 2 touchdowns as Portland State could not overcome the UNI running game. The North Dakota State Bison had a bye in round one before playing round two at home against Montana. The Bison dismantled the Grizzlies 37-6 thanks to a dominant defensive performance particularly against the run. Montana was only able to rush for 6 yards on the day with 19 carries. The defense also picked off Brady Gustafson four times with two of those returned for touchdowns. When Montana did score their lone touchdown, it was automatically canceled out by Bruce Anderson’s 100 yard kickoff return for a touchdown to end the slight hope of a comeback. These two teams did meet in the regular season here at the FargoDome. Carson Wentz threw for 335 yards with 4 touchdowns and 2 interceptions that day, but a broken wrist has sidelined him since mid-October. Whether Wentz plays against UNI is unknown, but what is known is that Northern Iowa will try to establish the run with Bailey and Smith while NDSU will try and stop it. If the Bison have another defensive performance like last week, it does not matter who is at quarterback. We will go with North Dakota State at home in this one to keep their drive for five straight National Championships alive 31-20. The winner of this game will play the winner of the Richmond at Illinois State game in the Semifinals. The Richmond Spiders faced a familiar foe in round two after an opening round by. They crushed William & Mary 48-13 in the opening round just two weeks after defeating them 20-9 in the regular season finale. The game really turned when William & Mary was trying to cut the 14-3 deficit to 14-10, but a 100 yard interception return by David Jones made the score 21-3 and the Tribe never recovered. Richmond had 302 yards rushing and 146 passing. All six of their offensive touchdowns came on the ground with three from Jacobi Green, two from quarterback Kyle Lauletta, and one from David Broadus. Illinois State also faced a conference opponent in the second round after a bye. They played Western Illinois at home and just like the regular season matchup, the Redbirds did not put them away until late. The game was 22-19 Illinois State with less than 10 minutes to play before two touchdowns in the final six minutes ended the Western Illinois season. Tre Roberson had another bad day passing (10 of 23 for 132 yards with a touchdown and two interceptions), but he made up for that with 111 yards and 2 touchdowns on the ground. As expected, Marshaun Coprich had a heavy dose of running and he was nearly unstoppable going for 217 yards and 2 touchdowns on 31 carries. Anthony Warrum was a bright spot in the passing game for ISU with 6 catches for 107 yards and a touchdown. Both of these teams have good offenses with each favoring one type of attack. On the season, Richmond has favored the passing game while Illinois State prefers to run the ball, but both offenses can use the pass or run. The defenses are far from spectacular, which means a lot of points could be in the forecast. We will take the Illinois State Redbirds to win after making the FCS Championship game last year in a 41-38 thriller. The winner of this game will face off against Northern Iowa or North Dakota State in the Semifinals. The Quarterfinals of the 2015 NCAA Division 3 Playoffs are upon us with only eight teams still standing. The entire schedule can be found here. After going 14-2 in round one, we went 6-2 in round two going against Wesley and Wisconsin-Whitewater (not a good idea there) for a Playoff total of 20-4. An updated bracket can be found here. Wabash has been slow starting their first two playoff games. They were down 14-6 in the third quarter against Albion before winning 35-14 and then pulled a similar stunt in round two against Thomas More. Wabash trailed 27-13 at halftime before rallying to tie the game at 27 and force overtime where they won 33-27 on a fumble return touchdown. St. Thomas took care of La Verne and St. John’s with strong starts that allowed them to go on cruise control. Another slow start by Wabash will certainly relegate them to a bad fate against a top quality opponent like St. Thomas. The Tommies look like the (slightly) better team here and we will take them to win 24-10 at home. The winner of this game will play the Mary Hardin-Baylor versus Linfield victor. Mary Hardin-Baylor has won their two games not in dominating fashion, but not in overly worrisome fashion either. They beat Hardin-Simmons 37-19 in round one on the road (avenging their only loss) and Huntingdon 43-23 at home. Now they face a Linfield team that is on a mission to usurp the Purple teams to the East. Linfield destroyed Whitworth 48-10 in the first round and defeated a feisty, but overmatched Cortland State team in round two by a score of 38-22. These two teams played in the Playoffs last year to the tune of a 31-28 game going to Linfield. That game was at Mary Hardin-Baylor and this year’s will be at Linfield. Linfield, however, may be without their quarterback Sam Riddle, which really levels the playing field. We still like Linfield to win 24-20 and play in the Semifinals where the winner faces either Wabash or St. Thomas (MN). Wesley easily beat Framingham State in round one, but had a more difficult time against Johns Hopkins in the second round. Wesley always seemed in control after building a double digit lead, but Johns Hopkins scored 13 points in three and a half minutes to provide a tense finish. Wesley prevailed 42-37 and now are rewarded with Mount Union. At Mount Union. Not much to say about Mount Union’s first two games, as they were dominant and won by scores of 55-23 and 66-7. These two teams met last year with Mount Union rolling past Wesley with unbelievable ease 70-21. These two teams put on a thriller in 2013 with Mount Union winning 62-59. We do not see either of those happening, but Mount Union should win this comfortably 52-30. The winner of this game will play either Wisconsin-Whitewater or Wisconsin-Oshkosh in the Semifinals. Wisconsin-Whitewater had no trouble with St. Norbert in round one, but found Wheaton a more formidable opponent in round two. The Warhawks were tied 7-7 after one quarter, but exploded for 24 points in the second frame to take a commanding 31-14 lead at half. That was more than enough as they won 31-17. Wisconsin-Oshkosh won their two games by a combined score of 90-7 and really have not been tested in their last three games. These two teams met on October 10 at Oshkosh in a game that saw Oshkosh prevail 10-7. It is hard to use that game as a barometer because Whitewater has done a 180 since then. They look much better on offense, but the Oshkosh defense has been playing lights out the last month. After going against Whitewater last week (and looking like a fool) we will do it again with Oshkosh squeaking out a 17-13 win. The winner of this game will play the winner of the Wesley-Mount Union contest. Just eight teams remain in the 2015 NCAA Division 2 Football Playoffs including three of the number one seeds in the tournament. All four quarterfinal games will take place on Saturday, December 5. After going 6-6 in round one, we improved to 6-2 in round two to bring our two week total to 12-8. The entire schedule for the Quarterfinals can be seen here while the updated bracket is here. Slippery Rock won their opening round game at home against Virginia Union 40-21 and had a tougher time in round two against Assumption. Despite leading 41-19 after three quarters, Slippery Rock gave up 20 fourth quarter points and held on thanks to a failed two point conversion. Shamar Greene ran for 160 yards and a touchdown while Dante Nania had 3 touchdown passes. Shepherd had a bye in the first round and found that Indiana (PA) was a tough out in round two. Shepherd trailed 13-3 entering the fourth quarter, but two touchdowns in the final 12:13 gave them the 17-13 victory. The offense managed only 264 yards of offense in a defensive battle. This game should have a little more offense than Shepherd had in round two. We like Shepherd to win this game 49-38 in a shootout. The winner of this game will play either Colorado State Pueblo or Grand Valley State in the Semifinals. Grand Valley State has been one of the surprises of this tournament with their two road wins. They defeated Ashland 45-28 in round two and then beat Ferris State with a touchdown on the Williams connection. Bart Williams found Matt Williams from a yard out to make it 38-34. Bart threw for 335 yards with 4 touchdowns and 2 interceptions while Matt had 5 catches for 126 yards and 2 touchdowns. Colorado State Pueblo has been impressive in their two games, which is not unexpected for the defending Division 2 National Champs. They beat Indianapolis at home 27-14 with the score line flattered by a late touchdown from Indianapolis. Their second round game was against top seeded Midwestern State and they had a 20-0 lead before Midwestern State made it 23-17 thanks to a turnover by CSU-Pueblo. This will be a big test for Grand Valley State’s offense against a quality defense like Colorado State Pueblo. GVSU has scored at least 24 points in each game while CSU-Pueblo has only allowed 24 points or more twice with those two games coming in September. We will take the defending Champs Colorado State Pueblo to win 27-17. The winner of this game faces either Slippery Rock or Shepherd in the Semifinals. While Grand Valley State has been the surprise on the left side of the bracket, Tuskegee has been one of the surprises on the right side of the bracket. Tuskegee delivered a big road win against Catawba in round one by a score of 26-16 after taking a 14-0 lead in the first quarter. Round two proved that win was not a fluke as they took out North Alabama 35-31 on a 2 yard touchdown run from Dennis Norfleet with 19 seconds left in the game. Norfleet finished with 136 yards and 2 touchdowns as the Golden Tigers overcame 4 interceptions from quarterback Kevin Lacey. West Georgia enjoyed a nice bye in the first round before facing Valdosta State in round two. West Georgia actually trailed 20-19 with 5:35 to play, but a nice response allowed them to win 27-20 in a hotly contested game. West Georgia had 292 yards and 2 touchdowns on the ground compared to only 77 yards and a touchdown through the air. These two teams met in the first round of the playoffs in 2014 with West Georgia prevailing on the road 20-17 as they went on to play in the Semifinals (lost to Colorado State Pueblo). This game should be close again and we will take Tuskegee to pull the upset 27-24. The winner of this game will play either Emporia State or Northwest Missouri State in the Semifinals. Emporia State delivered the shocker of the first round when they went on the road and defeated Minnesota State-Mankato 51-49. They had to hold on for that game, but they had no trouble in the second round when they crushed Henderson State 29-3 on the road. ESU had 268 yards on the ground as a team with Landon Nault having 179 yards and the lone rushing score. Austin Morton booted 5 field goals while Eddie Vinson had a fumble recovery in the end zone for a defensive score. Northwest Missouri State had a bye in the first round and then absolutely crushed Humboldt State in the second round 54-7. They led 21-0 after the first quarter and were up 47-0 before a touchdown past the midway point of the fourth quarter by Humboldt State. Shawn Bane had 7 catches for 134 yards and a touchdown. These two teams met on November 7 at Northwest Missouri State with the Bearcats dusting Emporia State 44-10. Brady Bolles threw for 362 yards and 4 touchdowns with no picks en route to the big win. This game looks like a replay of that contest especially if the Bearcats are as hungry as they were in the first round. Northwest Missouri State wins 49-7. The winner of this game will play either Tuskegee or West Georgia in the Semifinals.